Houston: An Indian-American doctor couple has donated a whopping USD 200 million to create a regional campus for a private university to potentially transform healthcare in the US that will also train doctors from India. 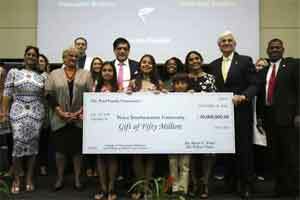 Kiran Patel, born to Indian parents in Zambia and his paediatrician wife Pallavi Patel’s gift to the Nova Southeastern University (NSU) located near Miami will allow it to open a new campus in Tampa. The donation from the Patel Family Foundation includes a USD 50 million gift and an additional USD 150 million real estates and facility investment in a 325,000 square-foot medical education complex that will be part of NSUs new campus. The campus will house a new site for NSUs College of Osteopathic Medicine, as well as its existing programmes in the Tampa area. The school is the largest provider of medical graduates in the state of Florida, it said. He said medical doctors from India will be brought to the US for a year-long residency in the country. “It will be like training the trainers,” he said. “This gift and additional investment will enrich NSUs ability to educate highly-qualified physicians and healthcare professionals who understand how the medical disciplines can and must work together,” said NSU President George Hanbury. “This USD 200-million-commitment will make NSU the premiere leader in healthcare education on both the east and west coasts of Florida,” said Hanbury. The gift is one of the seven-largest to any Florida university in history and largest to the university. The gift is Novas largest ever and one of the largest to a higher education institution in years.